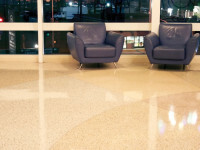 Terrazzo, an easy-to-maintain flooring surface, is becoming popular again! If you have a treasure trove of terrazzo that has been hidden for years under another layer of flooring, you might see its yellowed, scuffed appearance and assume that it can’t be restored. The highly trained, professional technicians at Hi-Tech Cleaning Services can work wonders with terrazzo, honing and polishing away the stained and damaged surface, and making those colorful little specks of marble glisten as much or more than the day of installation. Hi-Tech Cleaning Services can give new life to your terrazzo floors, polishing them to achieve a gloss or matte finish that eliminates the need to wax and strip. Call (914) 423-4600 or contact us online to learn more about our terrazzo floor cleaning, fine surface care and specialty cleaning in Westchester County and the NYC Area.